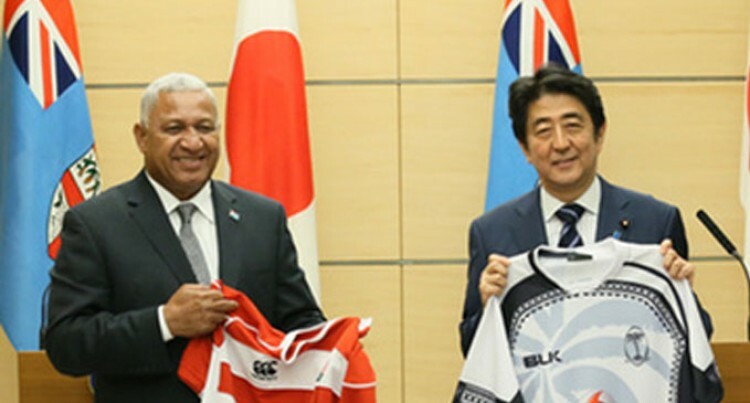 Japanese Prime Minister Shinzo Abe (right), with his Fijian counterpart Voreqe Bainimarama in Tokyo after they presented rugby jerseys to each other. Japan has pledged financial assistance for Fiji towards improving telecommunication and disaster risk management. Japanese Prime Minister Shinzo Abe at a media conference on Tuesday night revealed that 900million Yen (FJD15,288,036.79) will be set aside for Fiji. More financial assistance has also been pledged to train Fijians on leadership and human resource development by the Japanese government. Fiji has agreed to support Japan on international forums for reform of the UN Security Council. Better co-operation between Fiji and Japan on international forums has also been agreed upon. Meanwhile, Papua New Guinea Prime Minister Peter O’Neill hopes to meet with Fijian Prime Minister Voreqe Bainiamarama today. Mr O’Neill intends to have a meeting with the Japanese PM in the morning and is hopeful, if Mr Bainimarama’s schedule permits, to meet with him in the evening. Mr Bainimarama said he was not aware of Mr O’Neill’s intention but he was open to meet him on the peripheries of PALM 7 Summit. Both leaders are in Japan to attend PALM 7 Summit which starts tomorrow in Fukushima.